Hold a genuine banknote at the tips of your fingers, let's say a 10 Euro note. Your jacket sleeves are rolled up and, aside from the banknote itself, your hands are empty. Explain that you'll need only three seconds to double the value of the note! Believe me, you'll now have the full attention of your spectators and for good reason! Count "One" - Fold the ten Euro note in two. Count "Two" - Fold the note one more time. Your spectators will not take their eyes off the note and your fingers. Count "Three" - The note has already changed! Yes! You now hold a genuine 20 Euro note between your fingers. Unfold it and immediately show both sides - not a trace of the ten Euro note! How is this POSSIBLE? Your spectators never take their eyes off the note, yet you have transformed it into a 20 in full view, inches from their eyes! Before putting away the note, point out that you've just earned ten Euros in three seconds. Nota Bene: The transformation takes place in full view. The banknote is never hidden! Very easy to master and present! No thumb tip! Use your own banknotes, Euros, Dollars, Pounds, Chinese Yen, and Japanese Yen Resets immediately! 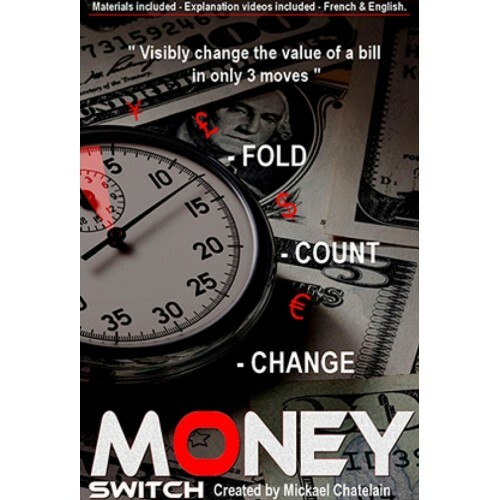 A bit more about Money-Switch: You will learn Money-Switch in less than ten minutes. Includes everything you need; just supply your own banknotes. If you can fold a banknote in three, you can do Money-Switch a few minutes after reading the method. Once you understand the principle, you'll be able to transform: A piece of paper into a banknote. A banknote into a newspaper. A receipt into a banknote, etc.